Released in 1997, 2004 and 2012 respectively. Here's a look at my "Obsidian" Air Jordan XII collection, original and retro. Click here to grab a pair on eBay. The "Obsidian" colorway of the Air Jordan XII was the last OG to be retroed in its true-to-the-og form. Retroed first in 2004 as a low top for the first time in June of 2012, they were back again and, in true form. 1997 is when they originally debuted making the gap between the first and most recent release, fifteen years! 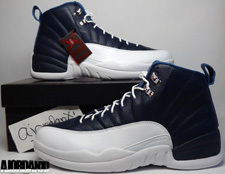 The long awaited, highly anticipated 2012 release did not disappoint and sold out right away. While most prefer the OG version to the '04 low's, some actually like the lows better. To each their own. Me, i've had the pleasure in owning them all but personally I too prefer the regular version. 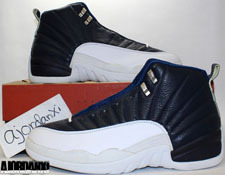 But at a time when it was unknown if that was going to happen, I settled for two pairs of the low's when they released. Enjoy the images below and if you're looking to add any of these to your collection, click here to grab a pair on eBay.